There are certain cars which need an updated every year just to be competitive, there are those who have an update once or twice every five or so years, and then you have vehicles which get an update only with a new generation. A representative of the latter is the Nissan Frontier. It continues to get virtually no changes, and some would argue it doesn’t need them. Nissan thinks so too, so the only fresh thing this year are the new color choices (of which there are three) and the moon roof option for the Crew Cab SV version. Other than that, it’s the same Frontier we saw way back in 2009. Even the pricing has stayed pretty much the same with only minor adjustments over the years. The Frontier remains a competitive truck, however. The new entries haven’t made it crack one bit. This vehicle segment seems to have two types of trucks. Those who remain old school and stick to the traditional ways, and those who get an update regularly, but reach mind-blowing prices just as fast. The traits of the Frontier are still here. It’s one of the few trucks that comes with a manual transmission in almost all of its trims, for instance, something you won’t see in the Colorado or the Tacoma. There is a decent number of drivers that like this but still we think that most buyers prefer automatic in this segment. If you think Nissan left the Frontier to die out, don’t worry, they know exactly what they’re doing by sticking to the old and tried method. It is pointless giving a truck, which is used mostly as a workhorse, a silly facelift or a new interface. Rumors suggest that we’re likely to see a brand new Frontier in a couple of years but nothing has been confirmed yet, so don’t hold out if you were thinking of buying the Frontier. To find out how it performs, read on. First, there’s the almost iconic styling. It’s become a living legend. The classic pickup shape with the small grille and large fenders just suit the Frontier so nicely. If it has a roof rack, it’s that much cooler, and we like this addition. It isn’t just great looking, but functional too. The fact that they’ve left it virtually the same for so long means it’s instantly recognizable now. It comes in a variety of flavors but not a regular cab sadly. First, there’s the extended cab dubbed King Cab and of course one of our favorite four-door pickups the Crew Cab. The bed can be had in five-foot or six-foot configurations depending on the trim and cab you go for. Either way, you can’t go wrong with your choice. The new color options we mentioned are Magnetic Black, Gun Metallic, and Forged Copper. These are of course an addition to the already established palette of Cayenne Red, Lava Red, Glacier White, Arctic Blue Metallic and Brilliant Silver. Like we said you can now have a moon roof on the Crew Cab SV, yet another simple but practical feature for the Frontier. We won’t discuss the exterior any further since everything that can be said about it has probably already been mentioned. Whether you like the design or not, it’s entirely up to you. Much like the exterior, the interior, and its design is a pretty much-known story at this point. Unfortunately, that doesn’t mean it’s good. The exterior has aged well, and people seem to take it generally as a plus, but the interior, on the other hand, did not fare so well. The design of the dashboard is boring and dull, especially with the big steering wheel and the small navigation screen. The shifter leaves little to be desired as well, having already been in production for more than seven years. The ergonomics can’t live up to the expectation too with poorly placed buttons and a slightly confusing layout. The plastics are cheap, and they certainly feel like it. 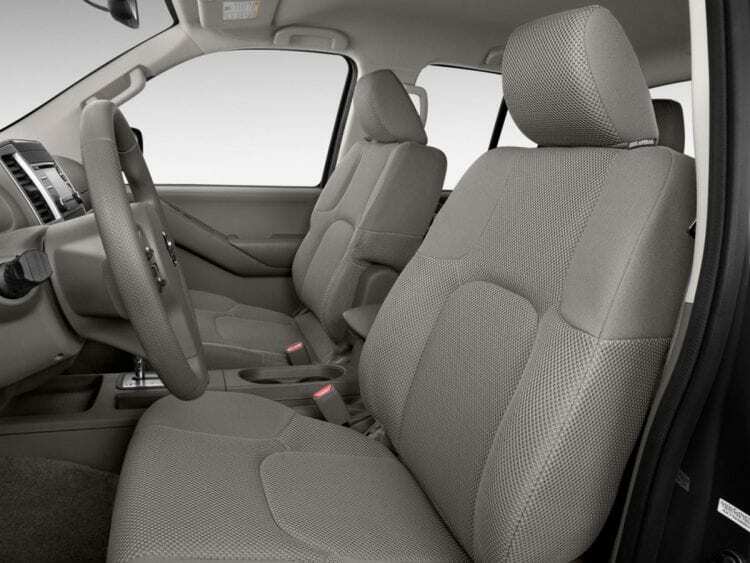 If you want interior quality look elsewhere, the Nissan Frontier is not the vehicle for you, and if we compare it with competitors, we need to say that this is a segment where it loses heavily. On top of that, we need to add that many customers are now buying trucks that are both used for work but also for daily family needs, so it does need to offer a decent amount of appeal in the interior. Despite that, however, the cabin is what you’d call functional and practical. It’s a comfortable place to be for long drives (although not to touch or see) and there are six color and material combos you can choose from. This gives each owner a lot of customizability and a fairly decent amount of mix and match options. The King Cab is capable of carrying four people, but the back seats should be used only when necessary. They’re old school seats which are slightly uncomfortable and cramped. There’s virtually no support for them, and they can barely fit two adults. If you have to use them, we suggest only placing kids or cargo there. The Crew Cab has had its seating improved. It’s still smaller than most competitors but can actually fit people now. One really cool feature is the fold-up seat bottoms enabling access to more cargo space when needed. The Frontier can be had with two engines. The first is the 2.5-liter four-cylinder base engine. It’s only available on the King Cab and develops not so impressive 152 hp and 171 lb-ft of torque. The second and the far better option is the 4.0-liter V6 producing 261 hp and an astonishing 281 lb-ft of torque. That torque figure is the best in the segment. Both engines are available with a manual and an automatic in both cab configurations. The difference being in the actual transmission systems. The smaller 2.5 unit gets a five-speed manual in the King Cab while the V6 gets the better six-speed. Both, however, share the same five-speed automatic transmission. 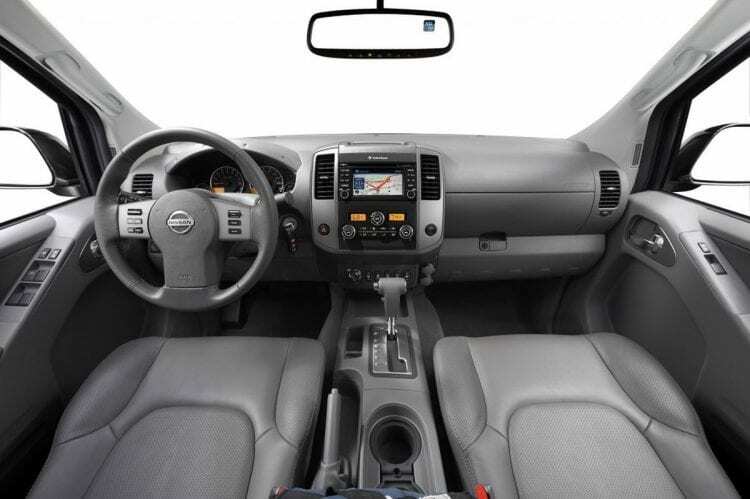 Like most midsized trucks you can have the Frontier in front-wheel or four-wheel drive guise. The 4WD versions get an electronically controlled transfer case which has low-end gears in addition to the high-end ones. If you’re planning on going off-road, we suggest you to pick the PRO-4X package. It comes standard with the 4WD system and the mentioned E-locker. In addition to that, you get all-terrain tires, Bilstein shocks, and matching skid plates for off-roading purposes. The graphics on the side of the truck are a welcomed addition too. 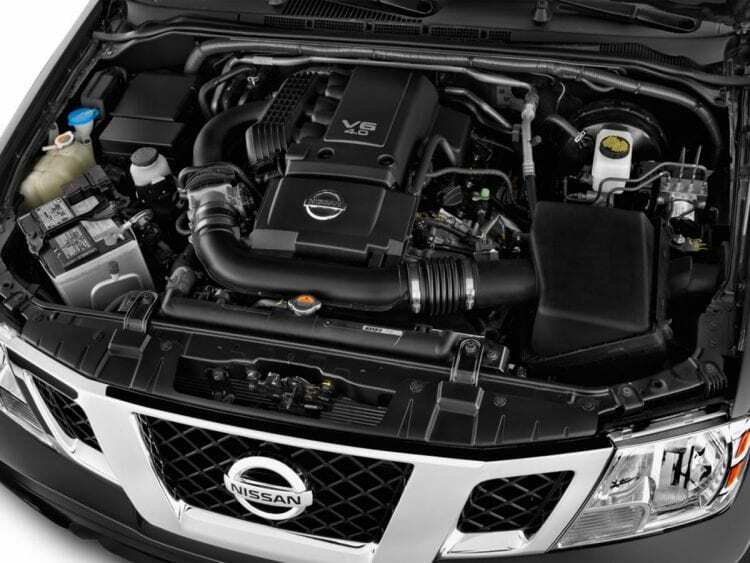 The 2016 Nissan Frontier also one of the most affordable vehicles on the market with a base price of just $18,300. If you can stretch your budget a little further, we suggest the V6 as it is a powerhouse. SV model equipped with auto and the V6 unit is priced at $24,440. In case you decide to go for Crew Cab, its base price is set to $23,500, and only available engine with this model is the V6.